As director of B Lab, Kim Coupounas has watched the B Corp community flourish across the world. More than 2,000 B Corps in 50-plus countries—and they’re all making the world a better place. Kim Coupounas, the director of B Lab, has been a part of the B Corporation community since 2007, after she and her husband cofounded an outdoor brand called GoLite. GoLite went on to become a Certified B Corp as it made beautiful outdoor equipment and apparel in an environmentally and socially responsible way. We recently sat down with Coupounas to find out just how much of a difference B Corps can make. gb&d: What is a B Corp? Coupounas: Simply put, B Corporations—or “B Corps”—are good businesses. Think of the B Corp certification as the “Good Housekeeping Seal of Approval” for mission-driven businesses. 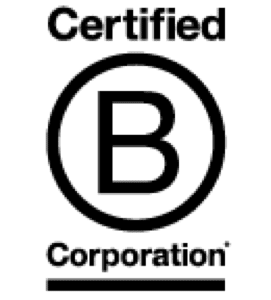 B Corps achieve an external certification similar to LEED certification for buildings or USDA Organic for food, but the B Corp Certification evaluates a company along a comprehensive set of sustainable business criteria. B Corps voluntarily undergo one of the most rigorous social and environmental assessments in the world. They are for-profit companies demonstrating that great business and good business go hand-in-hand. gb&d: Why use business as a force for good? Coupounas: We’re at a pivotal point as a civilization. Financial, environmental, social, and political crises have led to unprecedented populist unrest and lack of confidence in the capitalist system. Wealth is overly concentrated in the hands of few, carbon in our atmosphere has surpassed the 350 parts per million widely considered dangerous, and more than 80% of young people no longer identify with the economic system that has helped create unprecedented growth and comfort in the past 100 years. A lack of standards makes it difficult for consumers, investors, policy makers, and workers to distinguish good companies from good marketing. These are challenges that can’t be solved by government and nonprofits alone. What if we could mobilize the enormous power of for-profit business to solve some of the most intractable problems of our time? The growing movement of people striving to use business as a force for good is one of the most important social trends of our time. There are tens of millions of consumers, investors, and workers who want to align their purchases, investments, and employment decisions with their values. Research shows millennials seek meaningful work and investments that make money and make a difference. And since they represent 50% of the global workforce, they will shape the future like no other generation in history. gb&d: What’s one thing every business could do to be a forcefor good? Coupounas: Measure their impacts on their key stakeholders. We’re really good at measuring our companies’ financial performance, but globally, businesses are abysmal at measuring the impacts of their operations on their other key stakeholders. If every company could measure their social and environmental impacts with as much rigor as their financials—and could really deeply understand where they’re solid and where they have room to improve—we’d be on our way. The backbone of the B Corp community is a free online assessment and set of standards called the B Impact Assessment, bimpactassessment.net. More than 60,000 companies have used this assessment to work toward a more responsible business model. Every business should start there. How can you know how to be better if you don’t know where you are? gb&d: Who can become a B Corp? Coupounas: Any entity or organization, whether for-profit or nonprofit, can use and benefit from the standards embedded in the B Impact Assessment tool. But only for-profit companies can become Certified B Corporations. B Corps can be of any size and from any geography. We have a Standards Advisory Council that reviews cases of companies seeking certification from controversial industries such as tobacco or cannabis. A company needs to achieve 80 earned points on the B Impact Assessment (out of 200 points) to achieve certification and has to modify its legal structure to keep its full set of key stakeholders in mind in its decision-making, beyond just shareholders. gb&d: How has the community grown? Coupounas: The B Corp movement has grown tremendously. With the establishment of global partners in South America, Europe, Asia, Australia and New Zealand, and Africa, B Corps are spreading across the globe. We’ve also seen tens of thousands of companies using the B Impact Assessment to measure their impacts on their stakeholders and chart their path to a sustainable business model, even if they never choose to certify. Coupounas: The things that inspire me every day are the real changes companies make when they learn about B Corps and they choose to get on this path themselves. I hear so many inspiring stories from business leaders about how they are building values deeply into their business and how that work is not only transforming their business but transforming them as people and giving them hope for a brighter future for humanity. It’s deeply meaningful to me to be a part of that.